I’ll be in the South (as in USA) soon, so I better get me y’alls and yonders back out and dust ’em off. And speaking of dust, it hasn’t quite settled yet. Cleaning, sorting, packing, this move is wiping me out. I have managed to post a few updates on my Facebook page, but a full-blown post is just beyond my reach at the moment. A few weeks ago, I wrote a post for the fabulous Jenny of And Three To Go as part of her Monday Montage series. You can check that post out here. 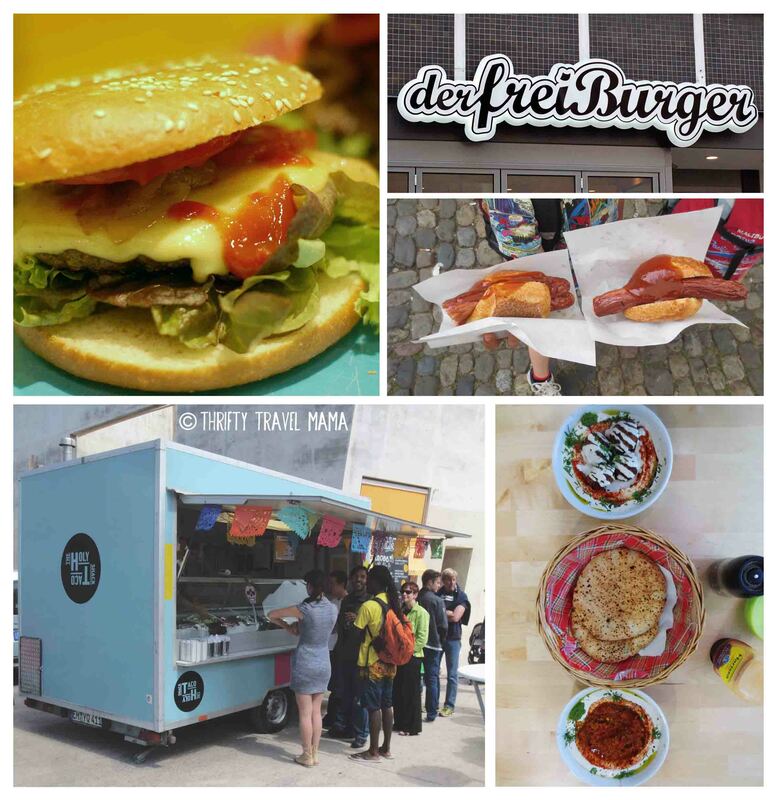 Consider it an ode to our adopted home here in Freiburg. We have only a little over a week left here, and I will miss it. 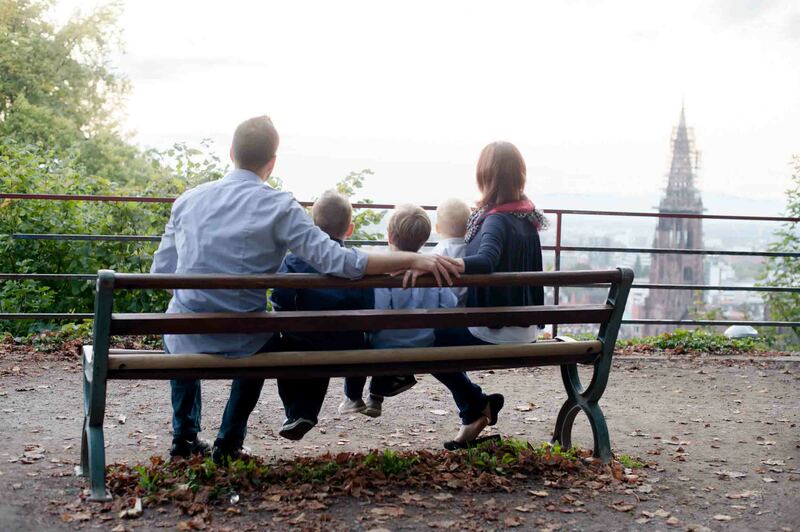 Freiburg is an awesome place for traveling families. So, do me a favor and click on over to read all about the daily life that we will soon leave (sad!). While you’re at it, be sure to follow Jenny as she writes about her family’s long-term travel adventures. Also, be sure to like the Facebook page as updates will most likely be from there for a while until I can get back to blogging. Thanks for reading and hanging in there during our time of transition! 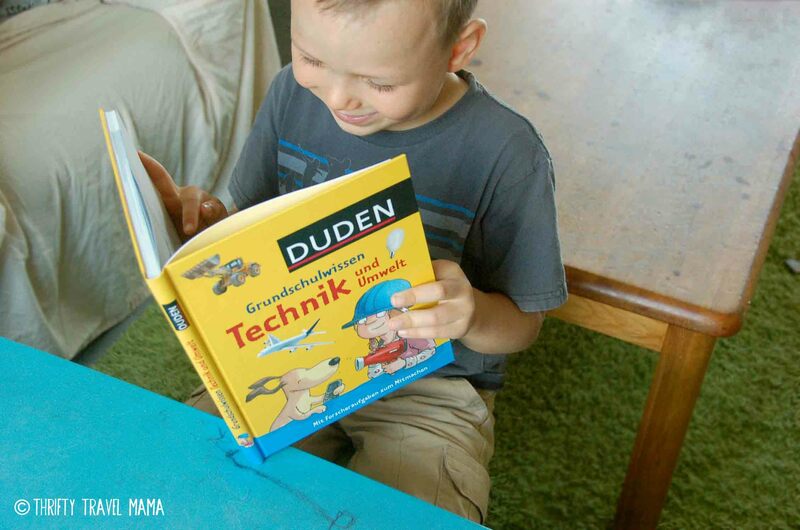 Review: Librileo Book Boxes for Kids.. auf Deutsch! I know this might sound a bit strange, but the main reason I’ve worked so hard the past few months to really get my German skills up to usable levels is that we’re leaving Deutschland by the end of the year. Why bother if we’re not going to live here long term? Well, for starters, it’s easiest to learn a language in a country where it’s spoken all the time. And, I’m determined to not sit by and watch my boys’ bilingual skills fade away. Since we can’t be certain we’ll end up in a city with a German school, the responsibility of keeping up with the language falls to me. So, you can bet I am all ears when it comes to getting tips on how to keep up the German in America… or wherever we end up. 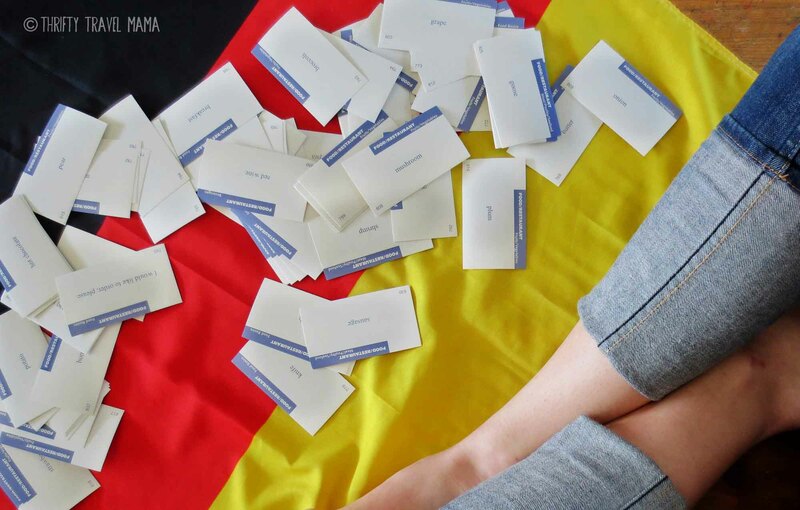 Yes, we can (and will) look for other German-speakers to befriend, but it’s important to not stop there. In order to become truly fluent, one must also know how to read and write. Obviously, having German books on hand is important. But, what books? How does one choose? And how do I know what level of books my boys should be reading? 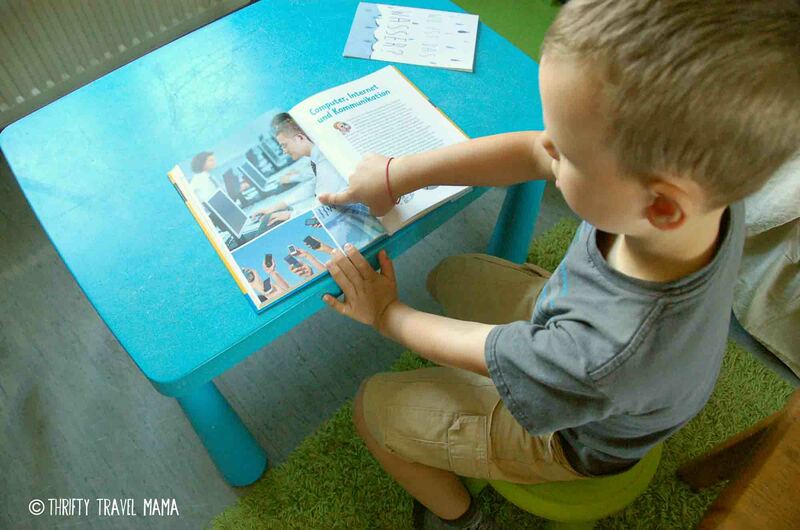 A startup company out of Berlin and the brainchild of Julius Bertram, Librileo is a genius idea for busy parents who value frequent and fresh reading material for their children. 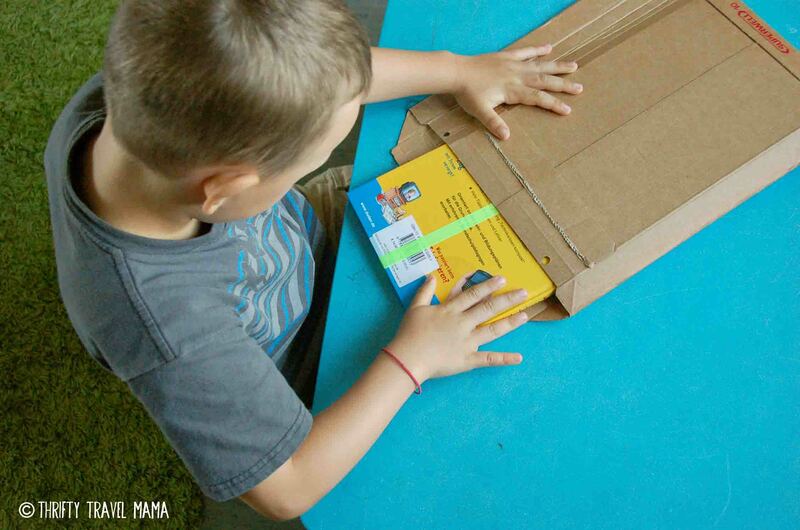 The child receives a monthly box of anywhere from 1 to 3 books appropriate for their age range and according to that month’s theme. Past themes have included friendship, courage, and music (see examples here). Each box is reviewed in advance by a test family and a teacher before being sent to subscribers. I was thrilled to be contacted by Librileo and offered a box for review purposes. I only review products here on Thrifty Travel Mama that I would actually use myself and this service definitely fits the bill. My oldest son is following in his mama’s footsteps and absolutely loves to get mail. He could barely contain his excitement when I told him the Librileo box was for him. 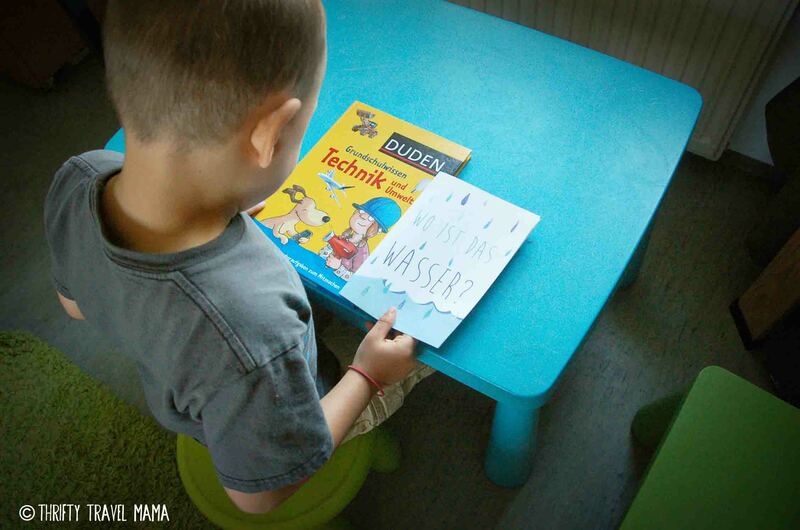 July’s theme is science (Wissenschaft), and we opened up the box to find a gigantic book about technology and the environment as well as a small booklet with a cute story about water conservation. Librileo offers book boxes for a variety of age ranges so that elementary-aged children don’t receive board books and toddlers aren’t given chapter books to chew on. Currently, there are six different age groups: 0-1, 1-2, 2-3, 3-4, 4-6, and 6-8. Have an older child? Drop them a line here. The company is considering expanding this fall to include boxes suitable for children up to age 10. Parents can order Librileo boxes for their children either on a one-time basis to try out the service, a recurring monthly basis, or as a set three-month subscription. Shipping is included in the price which makes the boxes a fantastic deal. The cost to buy the books yourself is about the same as going through Librileo. However, Librileo takes the guesswork out of what books to buy and if they’re age-appropriate, as well as adding a touch of fun by following a monthly theme. And, they have their own children’s book writer and in-house graphic designer who produce an extra story for the book boxes that aligns with the theme of the month. Bonus! But, what if you don’t live in Germany? We’re moving soon, and we won’t be able to take advantage of the libraries or loan books from friends here anymore. Well, Librileo has just expanded their service to include international shipping! The international boxes include the 7 euro shipping charge, which is absolutely reasonable. To read all the frequently asked questions regarding Librileo, click here. And when you’re ready to order, this link will get you where you need to go. 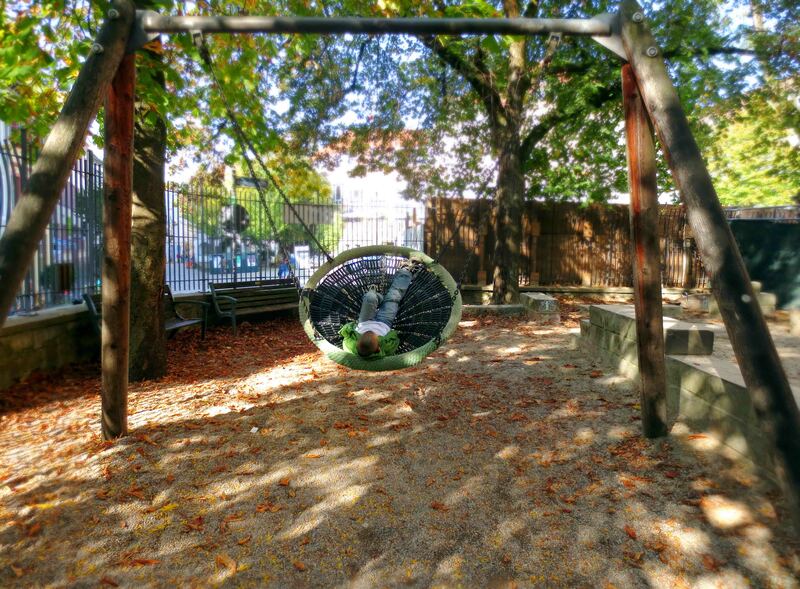 Once we have finalized the location of our new home, Librileo will be on our list of great ways to keep up with German culture and language outside of Deutschland. Viel spaß! Expat and bilingual families, what are some of the ways you keep up with foreign languages at home? Disclosure: I received a Librileo book box for review purposes. I was not paid to write this review, nor do I receive anything if you subscribe. You can read my current review policy here. Why, hello there. Didn’t think you’d see me ’round these parts again, did you? It has been a long time. And I’ve played out this reunion in my head many times. Has there been too much space and distance? Well, let’s just let it be awkward for a minute and then be done with that. Over now? Good, moving on! In case you’re new here, nearly four months ago I excused myself and backed away from this blog, forcing myself to turn and take one shaky step in the direction of serious language learning. Fighting the this is never going to work fears and I’d rather be blogging thoughts, it took all I had in me to walk in the door of the language school near my boys’ kindergarten and ask what they had available. You see, in our little city, the options for learning a language are as follows: (1) take an intensive course at a language school which means 5 days a week, four hours a day, (2) take a course at the community college for two days a week, two hours a day, or (3) find a private German teacher and pay through the nose. That’s it. Take your pick. What do you think I chose? What would you choose? Like many bloggers, I’m an introvert. I despise group work and small talk. Busy work for the benefit of the whole class kills my desire to learn. Plus, I’m a mama, and I know from my previous experience taking an intensive course that there is just NO WAY I can manage being gone all morning, every day of the week, plus do homework at night for more than one week at a time. The second option is just too slow. Plus, I honestly had no clue what level I was or which class to take. Believe it or not, I swallowed my thrifty ways and tossed an incredible amount of cash at a private teacher. But, old habits die hard, and I could not pass up an offer I found for two weeks of nearly free German classes. The catch? It was every night from 630-830pm, the absolute worst time of the day to leave my husband to solo parent. I love that man. Over the course of nearly sixteen weeks, I took over forty hours of private German classes as well as eighteen hours of group classes. In between that, I struggled to finish my homework with one hand while warding off the laundry, dirt, and stench beasts with the other. We may or may not have had pizza and chicken nugget dinners every other night..
Learning a new language as an adult is incredibly humbling. I watch my sons chatter away auf Deutsch, and I can’t help but be a tiny bit envious. It’s true that they essentially are in their own intensive course while at kindergarten four hours a day, five days a week. But, they also have no inhibitions. They’re not self-conscious at all when it comes to making mistakes or speaking with an accent. Ah, to be six again..
My German classes literally brought me to tears on several occasions because I felt so unbelievably stupid. Why is this so hard?! I would ask myself. My brain is just not wired to learn foreign languages. Undeterred by the snotty nose and runny mascara, I kept the end goal in sight: I am doing this for my sons, to help them keep up the gift of being bilingual as well as for own enrichment and mental health (ha). So, here I am, still plowing through, one umlaut at a time. Despite the difficulty, I’m happy to say that the payoff has been huge. Before these classes, I would shrink away from any opportunity to even attempt speaking German when it wasn’t absolutely necessary. I started almost every encounter with, “Do you speak English?” Now, I do my best to tuck that question away and only pull it out for serious situations like doctor visits and the like. Just yesterday, I met with another mom from my church that I barely knew. I was aware that she spoke English, but I made myself start things off with, “Wie geht’s?” (how are you?). I occasionally had to explain a few things in English, but I steered the conversation back to German after each detour. Thirty minutes of this kind of mental workout left me exhausted and literally sweating. Oh the things I never thought I’d do! Here are a handful of other examples that just a few short months ago would’ve been impossible.. Argue with a police officer about why I was breaking the rules (if you must know, I was riding my bike on the sidewalk with my kids at a dangerous intersection). Select, order, and pay for festival tickets over the phone (no hand gestures!). Read an entire parent letter from the kindergarten without the assistance of my pal Google translate… and understand what I read. Sign up for a tandem partnership with a total stranger. Consider asking all my German friends to only speak German with me (okay, I’m still on the fence about this one..). Sounds amazing and like I’m doing swimmingly, right? Well, don’t believe everything you read. Some days, the words won’t come. Other days, I won’t let them because I just don’t feel like it. In between those thoughts, I wonder why I am doing this. Why am I learning another language with the intention of becoming fluent? 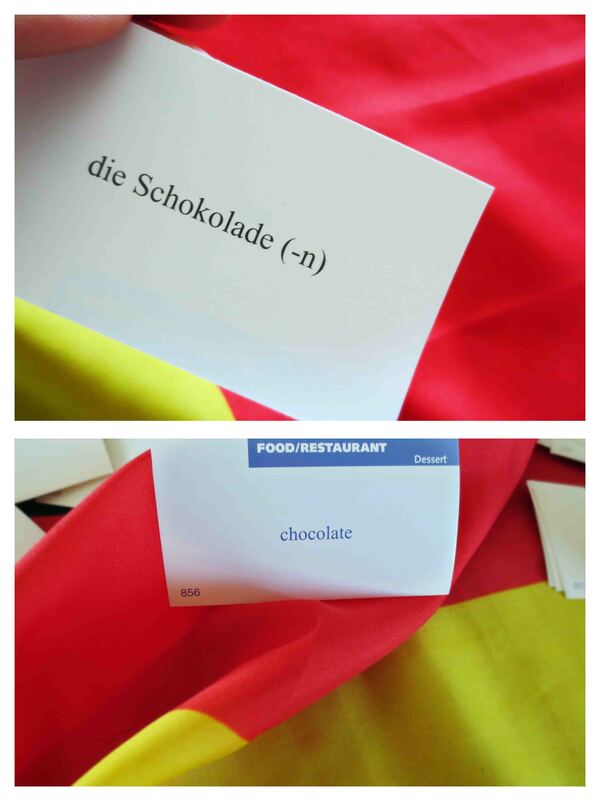 Why am I learning German? And, I’d be lying if I didn’t admit that there’s a downside. There’s always a downside, isn’t there? The truth is, I now feel like I can’t speak any language well. I often trip over words in my native language, often forgetting what common items are called in English (!). I end up stuttering and then scrunching my face up in frustration because I just can’t manage to squeeze the right words (in the correct language) out of my brain. I mean, I love bargains and all but the whole “buy one foreign language, get a free speech impediment” thing wasn’t exactly what I had in mind..
And when I’ve had a conversation with my tandem partner, for instance, I can’t seem to turn the German off and end up jabbering away in German to my husband who would rather just understand what his wife is saying, thankyouverymuch. The Deutsch monster just won’t shut up once it has been awakened. Well, I simply keep on keepin’ on. At this time, I am done actively taking classes, at least the expensive private kind. I feel like my German is at a level now that I might be able to handle a regular group class (though my introverted, anti-group-work self will surely protest this possibility). 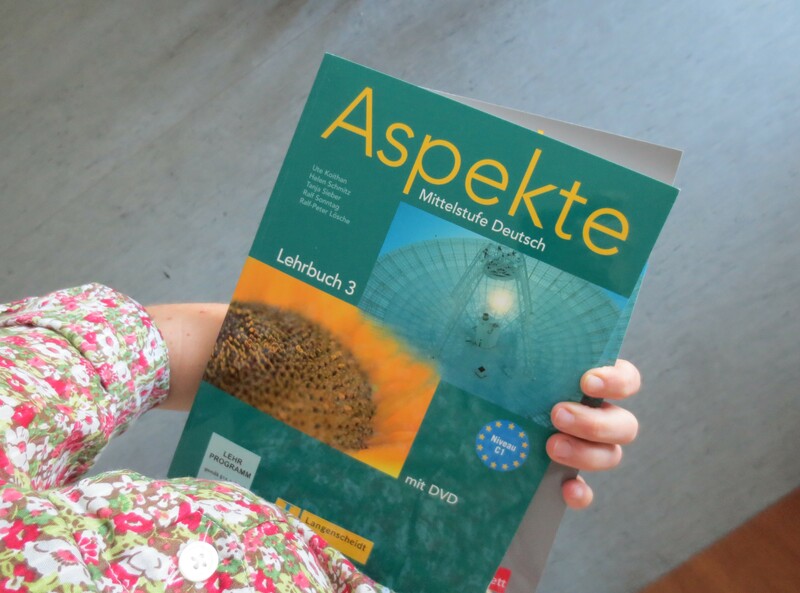 I bought a textbook and workbook with a DVD to keep up my independent study. But, really, what I need now is to just practice speaking as much as possible, hence the tandem partner. And, in between all of that, I’m going to try to hang out here at Thrifty Travel Mama more regularly. But, don’t worry, I won’t start blogging in German any time soon. Though I have missed blogging at TTM, I’ll admit it’s been a good thing for me to have a break, to refocus and, honestly, to decide whether I would like to continue writing. I’ve come to the conclusion that I do really enjoy blogging, because I often feel I have something to say either with the intention of helping others or simply throwing my two cents at the blogosphere. 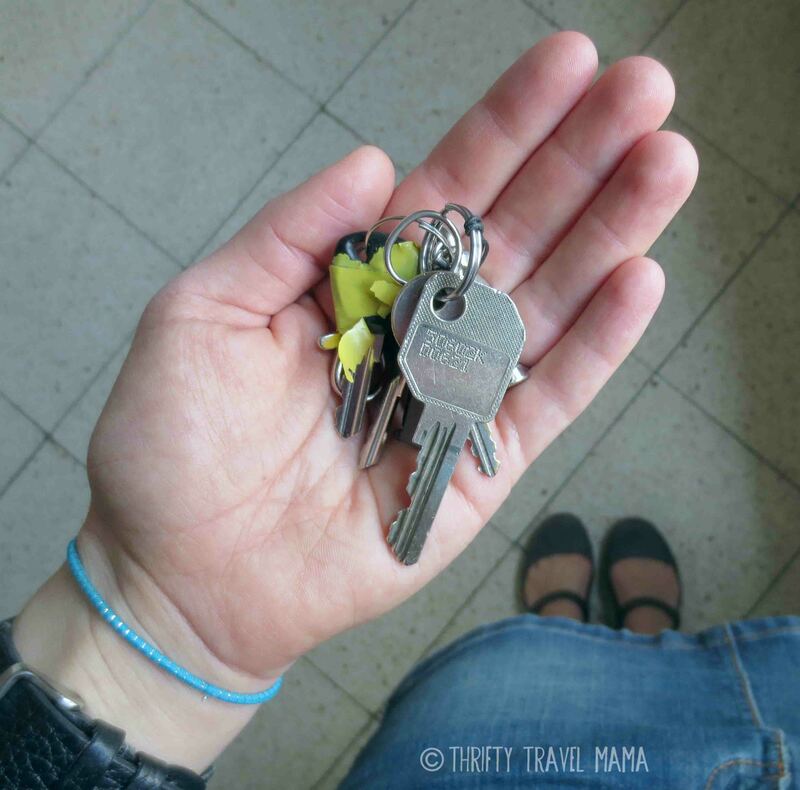 So, pull up a chair, add me back to your Blog Lovin’, feedly, or subscribe to posts by email and let’s do this Thrifty Travel Mama thing again! I often think to learn a second language you need as many of these things as possible – time, money, youth, and a live-in dictionary/language tutor. What do you think? And, if you’ve learned another language as adult, how was your experience? 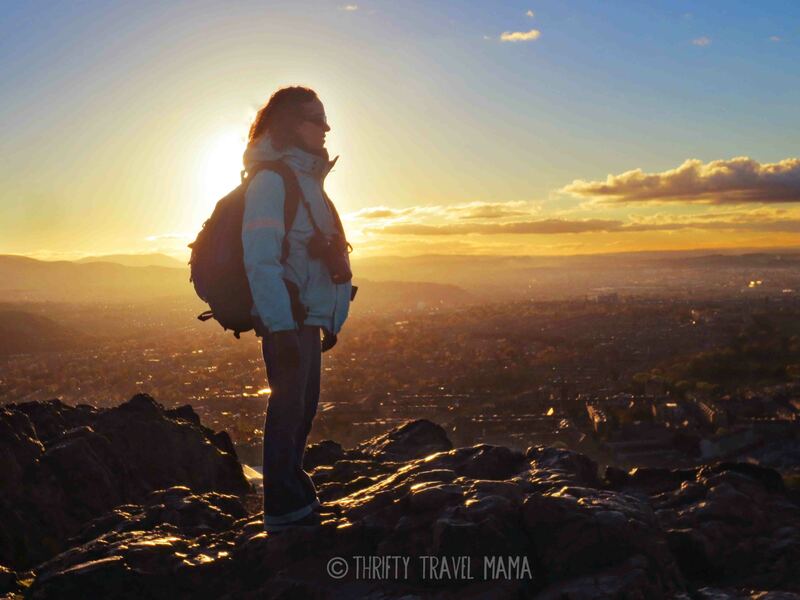 At the top of Arthur’s Seat, overlooking Edinburgh. Before Paris, we had the most lovely whirlwind of a trip to Edinburgh, Scotland. We had gorgeous weather and a marvelous time together, just the five of us. I long to tell you all about it – oh, how I do – but, for now, let’s just have a little peek into the wide, weird world of an English-speaking expat. When you live in a foreign country and don’t speak the language, you get quite used to living in a bubble. You may think the description cliché, but it’s spot on. Inside the bubble, things are quiet. Others may chat, giggle, debate, argue, or whisper around you. But the funny thing is… you don’t really hear any of it. There’s no picking up a snippet from the teenagers here or a stray comment from the elderly couple there. You have absolutely no idea if the person next to you is gossiping about her best friend or discussing the finer points of Nietzsche. When you open up your mouth to speak in your native language (because, of course, that’s what tumbles out first), those outside the bubble either stare or ignore you. It’s impossible to tell whether you’re understood or not because interaction simply does.not.happen. In some ways, you’re… invisible. One day, you find yourself in another place, a land where everyone hears, understands, and -gasp- speaks to you. This isn’t a forced exchange full of necessities and awkward pronunciation. No, here the conversation is effortless. The bubble bursts. And suddenly, everything just got a whole.lot.LOUDER. You try to finish your lunch, but the girl in the booth next to you just won’t shut up about her problems with the landlady. The college kids sitting behind you on the bus are bragging about how many countries they’ve visited (three), how cultured they now are, and how that one time they… was just SO funny! A man stops on the street mid-stride to suggest you try the coffee shop (his favorite) around the corner because you’re discussing where you should go to warm up on this chilly morning. You ask the bus driver to help you figure out which stop is closest to your holiday apartment, and he agrees, smiles (! ), and gives a shout when you’re nearly there. It’s hard to explain to someone who’s never experienced it, but going to a foreign country and hearing English spoken is really very strange. We’ve come to expect this hokey-smokes-we-can-understand-everyone-and-CRAP-they-understand-us phenomenon when we go back to the US. We become a bit disconcerted on the plane when flight attendants greet our children and make conversation. (Can you imagine someone talking to your child on the street and completely excluding you because they can tell you don’t understand? For us, this is our normal.) This disorientation grows until we finally recoil in utter shock when the cashier at the sparkly, big-box grocery store chats us up. This is reverse culture shock, and we live it every time we go to America. Since we know it will be our last year to live in our current city, we often try to imagine ourselves as residents in the places we visit. Could we live here? Would we want to? And while Scotland would take a lot of getting used to (I’ve never stared at traffic, drivers, and cars so much in my life – how do they drive on the left? ), at least we would be insiders in a way. Language. 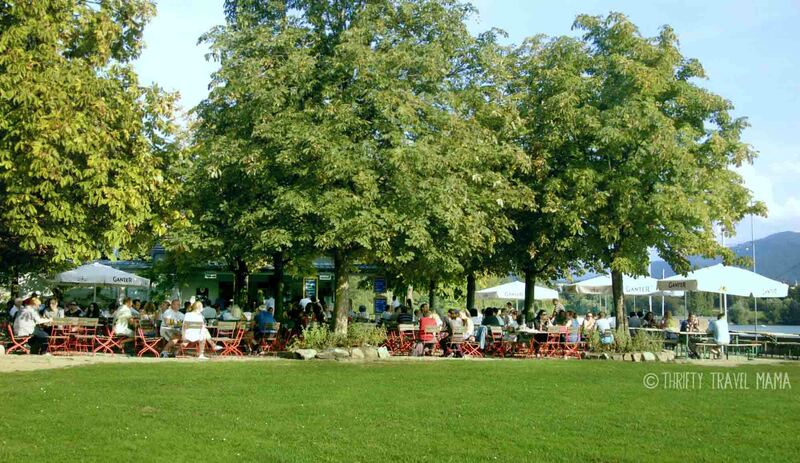 We miss so much being outside the deutschsprachig circle here in Germany. We cannot fight or fend for ourselves in many situations. ‘Tis true that I have only myself, my lack of time, commitment, and determination to blame. It is our/my struggle, and often brings me/us shame. So, in between language blunders and fragmented exchanges, we wonder. How important is it? Should we make every effort to become fluent? Is it time to pop the bubble and live out loud? And so with this long-winded attempt to explain the freakish feelings we experienced in Scotland, I have a small announcement to make. I love this blog for many reasons. It’s been my creative outlet for nearly four years. It’s pushed me to explore some really random corners of the world as well as to find the marvels and miracles amid the many mishaps of (my) expat life. But, most of all, I have loved meeting all of you. I have made real life friends because of this blog, and truth be told, I don’t intend to stop. 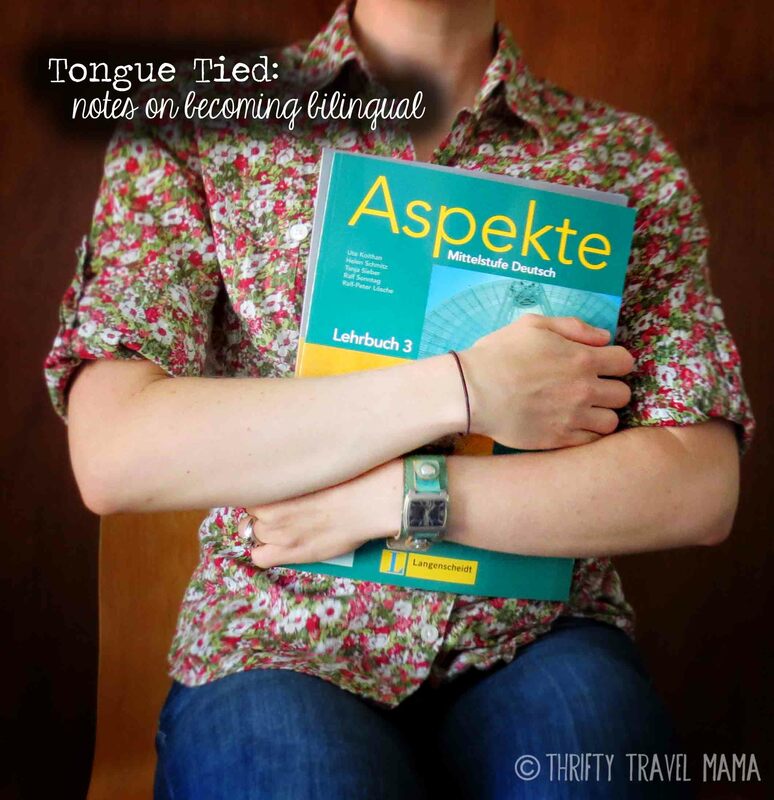 While I need to set aside the time I normally spend here at Thrifty Travel Mama to study German, I don’t plan on disappearing completely. I may post sporadic updates and quick recaps of our trips. But, I won’t be able to create regularly scheduled content for at least a few months. I still plan to answer comments (though you may have better luck with email), and I will still be reading your posts and cheering for your adventures. I hope, when I’m finally able again, that you’ll be back to champion mine as well. Wish me luck – it’s going to be DEAFENING out there. 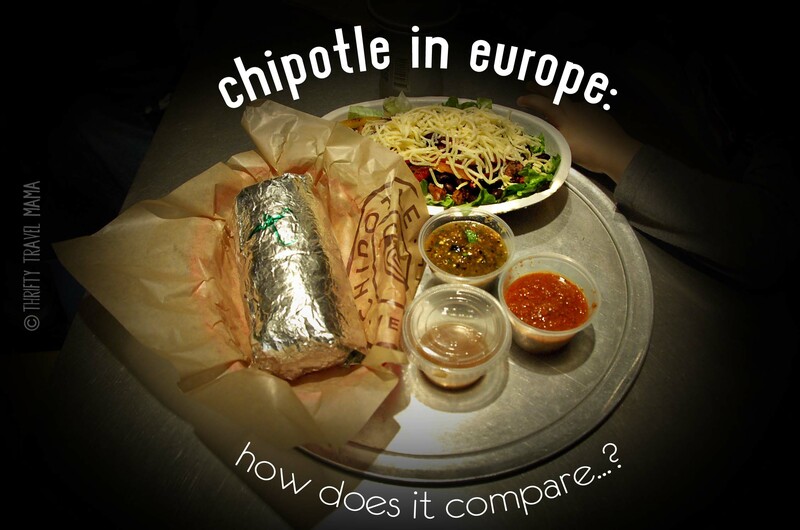 Chipotle in Europe: How Does it Compare? Hey, hey, happy February! ‘Tis the Valentine season, and cupid’s quiver is full of posts on…. Paris! I’ll be sharing all sorts of adventures, tips, and tricks for visiting the city of love with kids (oh, how romantic!) in the next few weeks. Other gals may go for diamonds, truffles, or expensive perfume and whatnot. But, me? I’m much easier to please. A three-pound burrito wrapped in shiny tinfoil should do it. While we were in the magical city of Paris, we savored our first taste of Chipotle in nearly eight months. It was the lovely Maria of Busy as a Bee in Paris who first gave the heads up that the burrito king was in town. In a span of two weeks, we had eaten our hearts out at Chipotle in France and Germany. 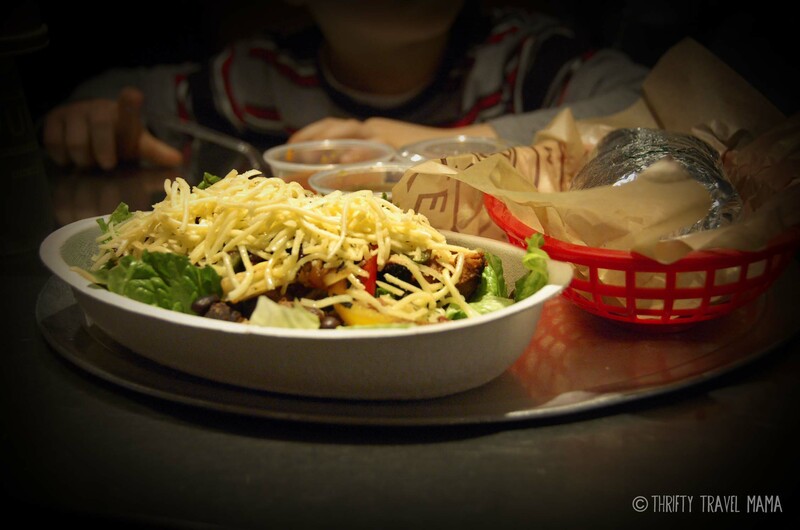 Chipotle… in Europe? I must be dreaming. But, I’m not.. they have SIX locations in London too! This is the real question, isn’t it? If you slap a Chipotle sign on a mediocre Mexican joint, really, what’s the point? The authenticity of ingredients and flavors is what’s important. In short, both the Paris and Frankfurt locations dished up burritos and salads that tasted very close to American Chipotle cuisine. However, we noticed a few slight differences. Serves lemon-cilantro rice, not lime, that is extremely cheap in the worst way (think Uncle Ben’s, not basmati). Beans are not as savory, especially the black ones. Marinade on the chicken wasn’t as flavorful. Salad dressing packs a punch – it’s much spicier than at home – and is noticeably creamier. Tomatillo-Green Chili Salsa tastes even better than in America with a delicious, gentle heat. Rice was also lemon instead of lime, but of better quality. Salad dressing was extremely close to the original, but it had a subtle difference we couldn’t place. Another taste test is on order..
Tomatillo-Green Chili Salsa is full of flame; our mouths were on fire! In both the French and German locations, the portions were petty. However, the staff acquiesced each time I begged for “a little more” of each ingredient. Not much is physically different in the Paris and Frankfurt locations. Both interiors are all done up in the same wood and stainless theme. The brown paper packaging, logo napkins, clear plastic cutlery, Tabasco sauce bottles… it’s all there. Even the water dispenser looks identical. The biggest difference between the American Chipotle and the French and German Chipotle restaurants is the price. Both European locations charge 9 euros per entree (burrito, tacos, salad, bowl) with your choice of one meat (chicken, steak, barbacoa, etc). All the toppings are included except guacamole which comes with an additional 3 euro charge. Yikes. Currently, a Chipotle chicken burrito in our old Orlando location costs $6.25 (steak, carnitas, or barbacoa will set you back $6.65). If you were to convert the 9 euro German burrito price tag to dollars, you’d be looking at $12.15 per burrito… or almost double! If you want guac with that, be prepared to fork over $16.20! That’s some serious cash for a beans & rice fix. You might be wondering… why are the entrees so expensive? 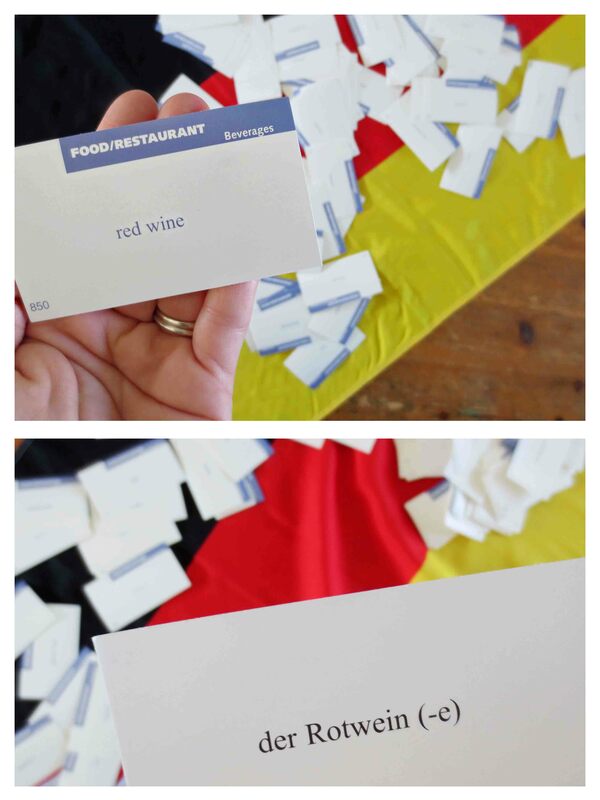 The simple answer: ingredients. To make Chipotle’s marinades, salsas, dressings, and other delicious menu items, you need foreign ingredients like chipotle peppers, tomatillos, cilantro, adobo, jalapeños, poblano peppers, and chiles de arbol. These are usually Mexican or American products which means that they need to cross an ocean. Unfortunately, the European palate doesn’t seem to be suited for frijoles which means that the demand isn’t high enough to produce these kinds of ingredients within the EU (perhaps climate is an issue as well) which would help reduce costs considerably. Now, I can’t say I’ve ever asked for “everything” on my burrito back in America, but both the French and German Chipotle locations allowed us to order every single topping (except guacamole – see above) without charging extra. I seem to recall that the fajita vegetables were instead of beans and that one may order cheese or sour cream. At the European restaurants, you can have it all! Frankfurt is our closest Chipotle location, but it’s still two and a half hours away. When we add the price of fuel to cost of a burrito, it ends up being too expensive and time-consuming to be worthwhile. In Paris, I was shocked when I realized that 9 euros for a quick dinner was average, so there’s a good chance we’d be regulars if we lived there. For now, we’re happily obsessed with our town’s taco truck. But, that’s not to say we wouldn’t indulge if we happened to be in Frankfurt… and I’d be lying if I said we wouldn’t jump at the chance to try a British branch of Chipotle! Any Londoners out there want to host a family of five for the weekend? Burritos are on us! 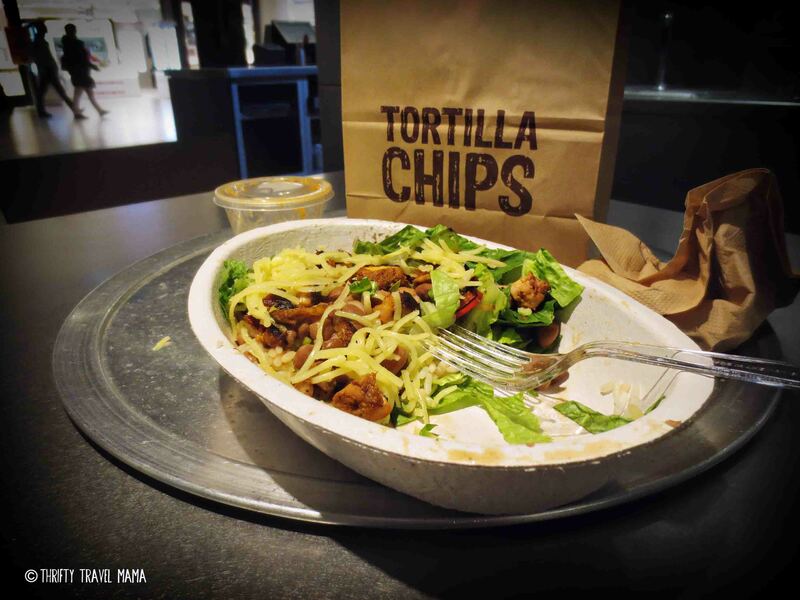 Have you tried Chipotle in Europe? If not, would you pay 9 euros for a burrito with authentic Mexican ingredients?